(Bloomberg) – South Africa’s Lesetja Kganyago has a fight on his hands to protect the central bank’s $50 billion of reserves. 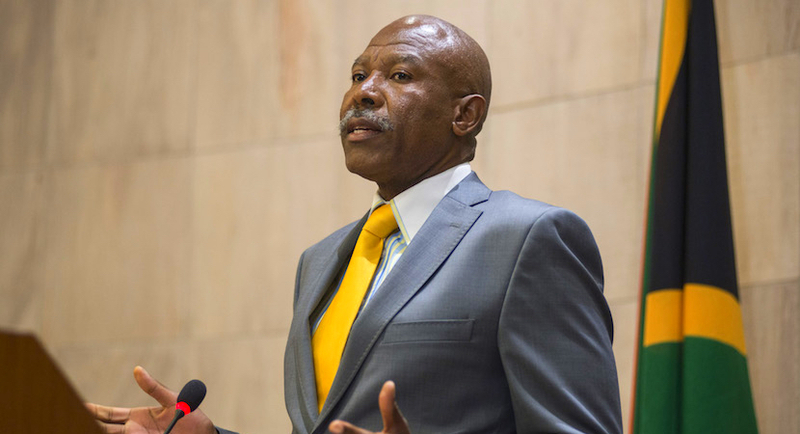 While the 97 year-old Reserve Bank’s shares are only worth about R20 million ($1.4 million) based on the current share price, some shareholders have argued the bank’s assets belong to them and they should be compensated for that when the government nationalises the institution, according to Kganyago. Eight percent of its 770 owners are foreigners, so steps to nationalise could be challenged using bilateral investment treaties or end in international arbitration. The rand slumped to its weakest level against the dollar in two years last month as upheaval in Turkey spilled over into other emerging markets. The currency was 0.2 percent lower at 14.7115 per dollar as of 7:16 a.m. in Johannesburg Monday. South Africa had $50.5 billion in gross reserves at the end of July and holds about R170 billion of deposits on behalf of the state, according to central bank data. EFF leader Julius Malema has tabled a private member's Bill to amend the SA Reserve Bank Act and among other proposals, the Bill seeks to make the state the sole shareholder of the shares in the bank. It's been referred to the Finance Committee for consideration. Kganyago, the 52-year-old former head of the National Treasury, fought off a proposal by the nation’s anti-graft ombudsman last year to change the constitution to take away the regulator’s inflation-target mandate. Last month, the radical Economic Freedom Fighters political party, which has won support by vowing to nationalise everything from land to banks, tabled a bill to make the Reserve Bank state-owned. The maximum price over the past six months for a Reserve Bank share, which is available over the counter since they delisted in 2002, has been R10. Investors share a maximum dividend payout of R200,000 a year. The stock is a “horrible investment,” according to shareholder Dawie Roodt, the chief economist at financial services company Efficient Group Ltd. He bought his shares more than two decades ago because they allow him access to the central bank’s annual meetings, where he can speak to its managers, Roodt said. Previous governors had an acrimonious relationship with some shareholders. Tito Mboweni accused one of disrespect in 2009 when the barefoot investor dressed in lederhosen, a traditional Bavarian garment, disrupted his AGM. Read also: SARB’s SHOCK revelations! Billions leaving SA illicitly while NPA fails to act. During Kganyago’s four years at the helm, those gatherings have become duller affairs that last less than an hour. If the government does become the sole owner of the bank, the meetings could be over in minutes, he said. The central bank would prefer to leave things as they are. Should nationalisation take place, Kganyago won’t give up the nation’s assets or allow tinkering with the mandate.